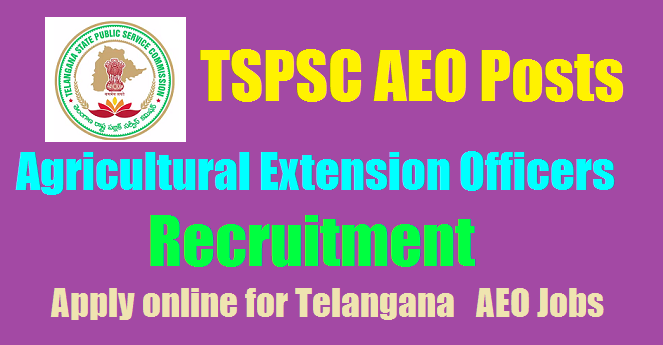 TSPSC Agricultural Extension Officers (AEO) Recruitment Application submission for Notification no. 51/2017 Agriculture Extension Officer. TS 851 Agricultural Extension Officers AEO Posts Recruitment Notification 2017 by TSPSC Apply Online TSPSC AEO/Agricultural Extension Officers Recruitment, Telangana Government Jobs 2017- 851 Telangana Agriculture Extension Officer (AEO) Jobs TSPSC To fill the vacant posts of 851 TS AEO posts, Selection Board of TSPSC has officially released employment advertisement. As per TSPSC Department Notification 2017, TSPSC AEOs Hall tickets, AEO Psts Recruitment final Results/TSPSC AEO/Agricultural Extension Officers Posts 2017/ TSPSC Agriculture AEO Posts 2017 Recruitment results: Telangana State Public Service Commission (TSPSC) has published a recruitment notification for filling up 851 Agricultural Extension Officers(AEO) Posts in Agricultural and Co-operational Department. Applications are invited Online from qualified candidates through the proforma Application to be made available on Commission’s webportal (www.tspsc.gov.in) to the post of Agriculture Extension Officer Grade-II in Department of Agricultural Subordinate Service in the State of Telangana. Online Application Form, Eligibility Criteria, Post details, How to Apply, Registration Fee, Last Date, Exam Date, Hall Tickets and Results are given here. TS AEO recruitment 2017 : Telangana Agriculture Extension Officer vacancies are going to fill up in Agriculture Department in various fields the categorization of posts are totally 851. TSPSC AEE Official notification is already uploaded on website. candidates can read official notification before applying for these posts. Online application for Telangana AEE vacancies 2017 started. Applications starts from 13.10.2017 and Last date for Apply Online is 31.10.2017. For this candidates need to keep in touch with us for further details like important dates, eligibility criteria. application fee, selection process, age limit, pay scale, how to apply etc. regarding Telangana AEO Notification 2017 Online for 851 Posts is given below. Application submission for Notification no. 51/2017 Agriculture Extension Officer. 2) Diploma in Agricultural Engineering. (1) The vacancies notified shall be filled with the candidates who possess the above qualifications in the ratio of 4:1:4:1 respectively out of every 10 vacancies. (2) If the candidates with the said qualifications in the ratio prescribed are not available among the applicants, such vacancies may be filled with the applicants available with other qualifications in the rotation as per merit. 4. The Examination is likely to be held on 21st Nov' 2017.